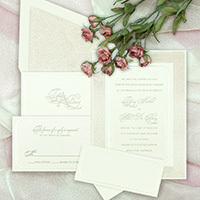 Unique and appealing, this incredible deluxe wedding catalog has many enticing new features. 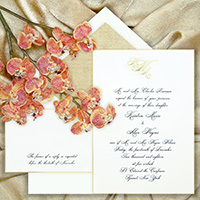 Exquisite invitations showing new satin and lace designs are beautifully displayed with matching inks and carefully chosen typestyles to intricately follow through on the elegant feeling. 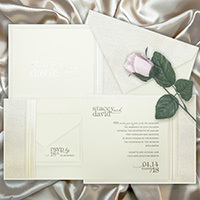 A wide variety of triple thick hand beveled and foiled edged invitations are displayed with matching foil embossed monograms in silver, gold, champagne and copper foil. 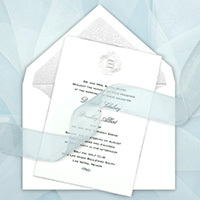 Rounded corners are introduced on a variety of foil embossed borders, ice invitations, laser cut lucite invitations and on foil edged invitations. Deep sculptured embossing is displayed as picture frames, edging, appliques and other decorative adornments, exuding sophistication and originality. Embossed designer patterns are presented as layers, liners and flap appliques on our exclusive and incomparable stardust and moonbeam papers. 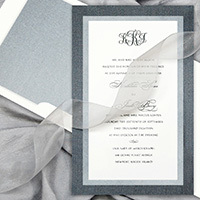 Handmade papers, hand torn deckle edges and stones further enhance the selection. As customizing and attention to detail is our speciality your wish is our command. In addition, our complete in house facility allows us to execute your special orders cost effectively and time efficiently. 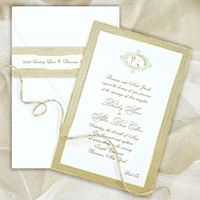 Retail prices range from $400 to $1700 per 100 invitations.